Are you looking for a delicious beef recipe with a difference? If you are, you’ve found it! Here’s my warm beef salad with artichokes, chilli & walnuts for you to enjoy. Sardinia is famous for its beef, particularly that of the bue rosso (red cow), which grazes the pastures of the volcanic Montiferru area in central-western Sardinia and is considered by many to provide the finest beef in Italy. 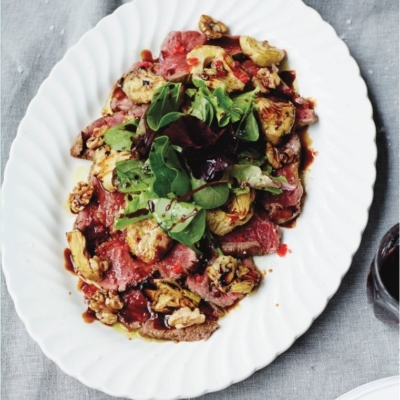 For this recipe I have taken the theme of a traditional Sardinian beef salad and have added artichokes and walnuts – which really complement the juicy sides of warm beef fillet – plus fresh chilli to provide a little extra kick. 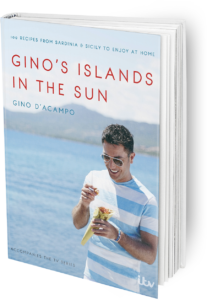 Serve with Sardinian flatbread (which you can find on page 108 on Gino’s Islands in the Sun! 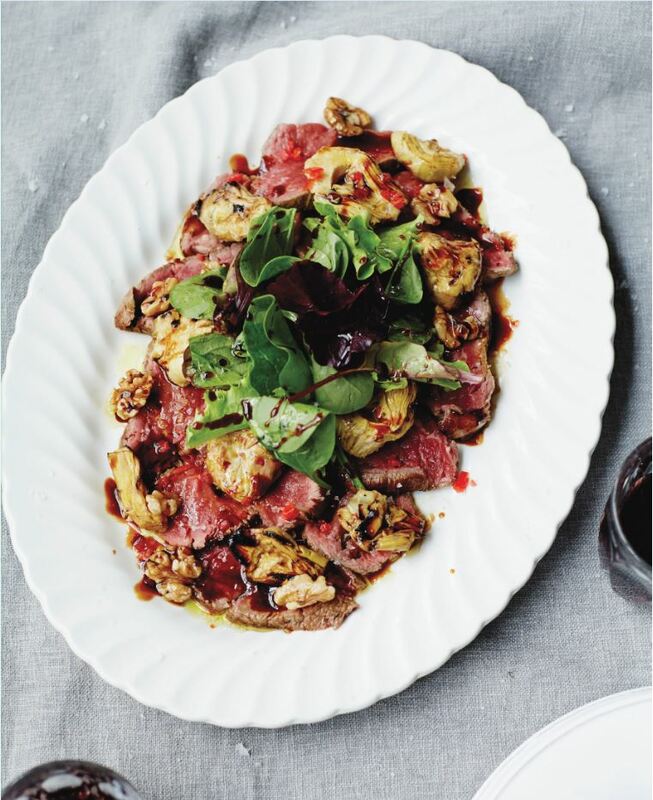 Feast your eyes on the finest warm beef salad with artichokes, chilli & walnuts! It’s straightforward and fun to make this great dish. Simply follow the instructions below and get the perfect result. Preheat a large frying pan over a medium heat. Rub the beef all over with half the oil and season with salt. When the pan is very hot, lay the beef in the pan and brown on all sides including the ends. Remove the beef from the pan and leave to rest on a board. Cover with foil to keep warm. Add the artichokes and chilli to the pan. Combine 60ml hot water and half the balsamic glaze and pour the mixture over the artichokes. Stir, bring to a simmer and set aside. Carve the beef into slices about 5mm thick and arrange on a large serving platter. Spoon over the warm artichokes, chilli and liquid and arrange the salad leaves and walnuts on top. Drizzle over the remaining oil and balsamic glaze and sprinkle with a little salt. Once you’re done, simply sit back and enjoy your warm beef salad with artichokes, chilli & walnuts and don’t forget to check out other great authentic Italian recipes including great antipasti recipes, Italian pasta recipes, Italian soup recipes, Italian beef dishes and authentic pizza recipes.